Rent a dumpster to clean up your junk! We specialize in hauling waste from household junk or construction and demolition removal, and recyclable removal clean-ups on Long Island and in NYC, including places like Smithtown, Farmingdale, Riverhead, Hicksville, and all surrounding areas. When you rent a dumpster from S&A Container Service you can choose from a dumpster rental between 6 and 40 yards to best meet the size of your construction and demolition removal project. Dumpster rentals are available for up to 14 days, but we’ll gladly accommodate longer time frames if your construction and demolition project or household clean-up project lasts longer. 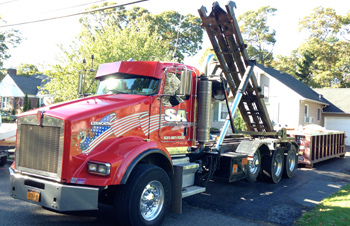 S&A Container Service’s customer support team will help you select the right size dumpster rental for your project, based on contents and the space available on your property or driveway. For example, a 10 yard dumpster rental may be appropriate for tearing down a small bathroom, small basement, one car garage, small attic, small shed, small deck, 1200 sq ft of single layer roofing debris, spring yard clean-up, galley kitchen remodeling, and similar size debris removal projects. Common Uses: Recycling of unwanted debris, construction projects and yard construction and demolition removal, new construction, renovations, and home extensions. Call to ask us about flat rate dumpster rentals for clean concrete, brush and logs, and asphalt all of which are recyclable material. We serve all of Nassau & Suffolk County, including Hicksville, Riverhead, Smithtown, Farmingdale, and all surrounding areas! Roofing debris is measured in 100 sq. foot units, typically called squares. For a single layer roof (some are double or triple layered), four squares consume approximately one cubic yard in a dumpster. See the chart below for recommended roofing dumpster sizes.